John’s story is eclectic. Starting out as a professional singer-songwriter, he now works as an author, speaker, historian, and media presenter. He has published 15 books, two of which have become television documentaries, with a third (For the Love of God: How the Church is Better and Worse than you Ever Imagined) released in cinemas and on ABC TV in late 2018. He teaches a course on the Historical Jesus at the University of Sydney, Australia, and researches the origins of Christianity in the Roman empire. For 2017-19 he is also a Visiting Academic in the Faculty of Classics at Oxford University in the UK. He is the newly appointed Distinguished Fellow in Public Christianity at Ridley College Melbourne. 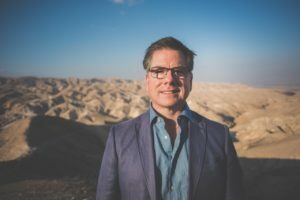 In all that he does, whether in the media or the church, creative or academic, he strives to be a public advocate for the Christian faith in doubting times. Having lost his father in an air disaster at 9, John is mindful of the sorrows and doubts of our world, and values his wife and three children above all other gifts of this life. Farewell Sydney on an Emirates flight to Dubai departing with a connecting flight to Amman. Upon arrival at Amman International airport we will clear customs and transfer to the Israeli border crossing at Allenby Bridge and continue to the city of Jerusalem. On arrival check in to your hotel for a time of rest and refreshment. In the late afternoon visit the Tower of David Museum to enjoy an overview of Israel’s history and the geography of Jerusalem. Return to the hotel in the for a pre-dinner lecture by Dr Dickson on ‘Jesus in Contemporary Scholarship’. Dinner and overnight in Jerusalem. A fantastic day trip today as we have an early start departing Jerusalem through the Judean wilderness to the fortress of Masada built by King Herod. Continue to Qumran, the site of the discovery of the Dead Sea scrolls in 1947 and home to an exclusive Jewish sect known as ‘Essenes’. We then travel to the Dead Sea for a swim and the spectacular view from the Wadi Qelt, the famous road from Jericho to Jerusalem. Return to Jerusalem for dinner and overnight. Lecture topic: ‘The Judaism(s) of Jesus’ Day’. We set the scene for the birth of Jesus in the Roman World. Today we make an early start to visit the Dome of the Rock located at the Temple Mount in the Old City of Jerusalem. From here we will travel to Herodian, the town built by King Herod. We continue to Bethlehem, birthplace of Jesus to visit the Shepherds Fields and lunch. The afternoon will be spent in the New City of Jerusalem at the Israel Museum where you can see the Dead Sea scrolls and an impressive model of Jerusalem as it was in the period just before its devastation by the Romans in AD 70. This morning we check out of our hotel in Jerusalem and travel north to Nazareth. Stop at Mt Precipice lookout to see the city of Nazareth and the surrounding Jezreel Valley. Continue to Nazareth Village a working farm that replicates life as it was in the first century. An early lunch before driving to Sepphoris, the ancient capital of Galilee and centre of Jewish learning. 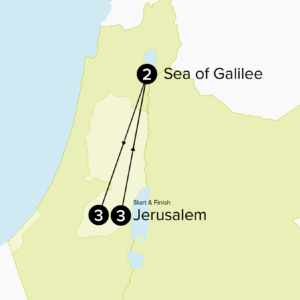 Lecture onsite: “Galilee and the beginnings of Jesus’ ministry”. Continue to Tiberias before Shabbat celebrations begin. Rest of the day free. We discover how radical Jesus’ message was to his fellow Galileans. This morning after breakfast we will visit Gamla, known as the Masada of the North. Here you will see an impressive first century synagogue and hear an onsite lecture: ‘Jesus and the Zealots’. Continue to the Golan Archaeological Museum in the town of Katzrin before returning to Galilee via Mt Arbel (for magnificent views of Galilee) in the late afternoon. Overnight Tiberias. We learn of tensions between Jesus and the elites of his day. Travel by coach to Magdala, the home town of Mary Magdalene and the site of recently discovered first century building including a synagogue. Brief lecture onsite: “The women in Jesus’ life”. As we farewell the Galilee we stop at Beat Shean (Scythopolis), an impressive Greco-Roman Old Testament city. Return to Jerusalem for dinner and overnight. We explore the climatic events of Jesus’ life (and his demise). Sunrise at Mount of Olives gives you an exceptional overview of the Old City of Jerusalem. Return to the hotel for breakfast. We then visit the impressive Davidson Archaeological Park, located next to the Temple Mount. The Centre combines an exhibition of a rich archaeological content and computerized media, artefacts exhibitions, and an illustrated and visual exhibition following events spanning 5000 years from the Canaanite Age through to the First Temple period. We then visit the Western Wall which is the site for Bar Mitzvahs every Monday. Lunch in Old City followed by the afternoon free to explore the Old City. We walk the bridge from Jesus to Christianity. An early morning visit to the Church of the Holy Sepulchre with a lecture on “What can historians say about Jesus’ resurrection”? Return to the hotel for breakfast and check out. Farewell Jerusalem and drive to the Mediterranean coast to Caesarea Maritima, the port that the apostle Paul departed from on his missionary journeys. Enjoy lunch here and a tour of the site. Dr Dickson will deliver a lecture onsite “How Christianity became a world religion’. Our farewell dinner will be on the Rooftop at the Notre Dame Centre in Jerusalem. Check out of the hotel after breakfast and return to the Jordanian border and on to Amman Airport for your 5pm Emirates flight home. You are welcome to extend your stay with an optional Jordan extension including Mt Nebo, Petra and Wadi Rum. This tour is limited to strictly 40 passengers. Registrations will be taken on a first come first serve basis. As this tour is quite short, we are pleased to offer a 5 day/4 night extension in Jordan. Travel south to Wadi Rump with stops at Mt Nebo (where Moses saw the Promised Land) and Madaba which is home to the oldest known mosaic map of Jerusalem. Check in to your desert camp for a overnight stay. A full day at Wadi Rum including a desert safari and optional camel ride. Late afternoon travel to Petra, check in to the hotel for dinner and overnight. Today we visit the UNESCO World Heritage site of Petra. Later in the day we will also visit Little Petra and Moses' Spring. Overnight Petra. Check out & farewell Petra and return to Amman for a city tour and a special dinner at a local restaurant. A free day in Amman before a transfer to the Queen Alia airport for your 5pm Emirates flight home. 1 night Gerasa Hotel, Amman including breakfast & dinner. Travellers with Qantas frequent flyer memberships are also welcome to nominate this for (reduced) points. Travel extension requests must be received in writing no later than Friday 28 June 2019. Travelling to ancient places means that many surfaces are cobblestoned and uneven. When on tour there is a reasonable amount of walking every day (average 6-8 kms per day). Days can be long with early starts. You need to be of sound physical health and fitness to maximise your experience on the tour. If you have any concerns about your health and fitness, please speak to us. The balance of payment is due Friday 28 July 2019. Dr Dickson will present a series of lectures throughout the tour. His preference is that each traveller takes an iPad mini to refer to the notes and documents he will make available. If you do not have an iPad, Selah can assist with the rental of one (from Australia) for the duration of the tour. Details of the rental will be provided when your place on the tour is confirmed.